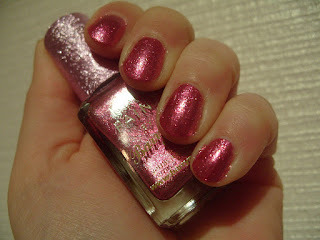 NOTD: Barry M Xmas Limited Edition "Christmas Pink"! 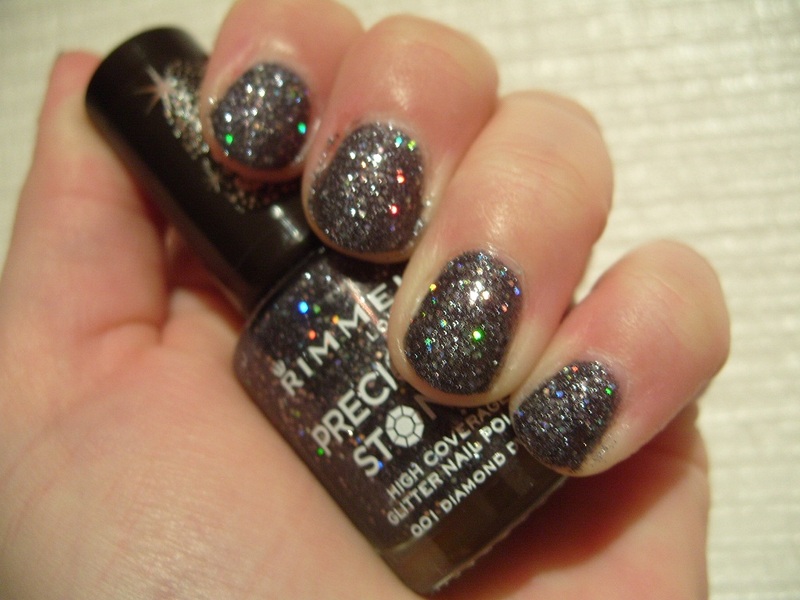 This is one of 4 killer limited editions for Christmas from Barry M! This one is from Boots, there's a pink and a gold, they are free with a purchase of £6 from Barry M :) Promo starts today so be quick if you want one! 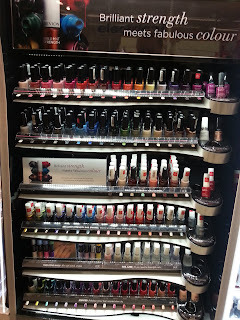 I can't wait for the blue version of this from Superdrug - that promo starts 5th December! This is an old nail-tastic polish I found in my Helmer tonight as I was raking through trying to find something I wanted to put on. I'd nearly forgotten about my Barielles :) It was between "Date Night" and "Decadence" which isn't an easy choice! But true green prevailed. I did struggle with the formula on this, I think it's maybe going a bit thick in it's old age so need a bit of thinning. 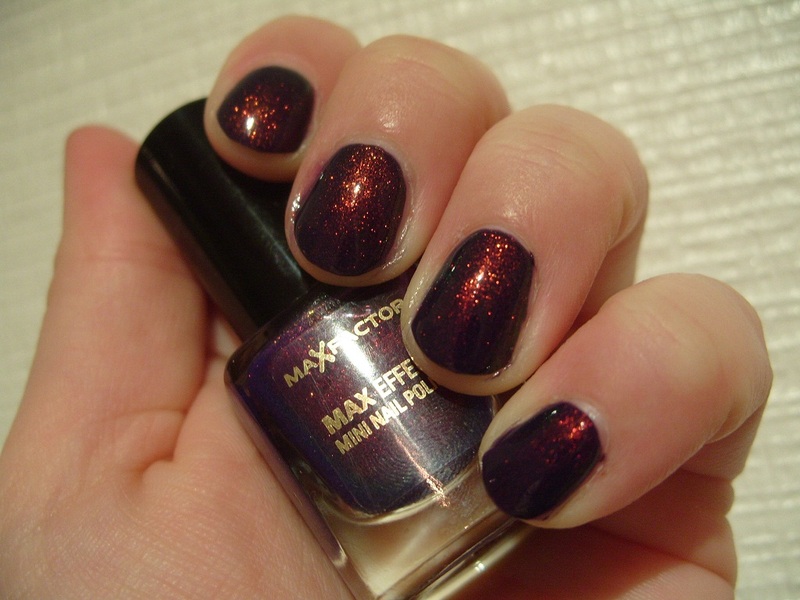 NOTD: Max Factor "Fantasy Fire"
Now for something completely different. I've finally discovered which combination of hand products that actually started to heal my horribly dry and scaly hands and cuticles. During the day I use Aveeno Hand Cream, then at night I put on a generous dollop of Burt's Bees Hand Salve and then massage in a cuticle oil (even though the Hand Salve is quite oily - the nail oil has smaller molecules which penetrate deeper into the nail). I am currently using CND SolarOil but I am thinking of trying out the new Dadi'Oil which a lot of other professionals are using just now. The Aveeno Hand Cream does contains silicones which I don't generally like but it acts like a 'glove' on your hands so you will get away with not putting cream on again after every single hand washing which is good as that's not always practical. I love the smell of Burt's Bees Hand Salve but if you find it's too greasy, just pop on some cotton gloves over it as you retire for the night :) It's finally showing an improvement in my hands, my sore scaly palms are smooth again and cuticles aren't as dry. I hope it will continue to improve as I use it and keep the lizard skin at bay this winter! NOTD: Rimmel Play Fast "Camouflage"
Do you have a polish that you have a back-up bottle of because you love it so much? 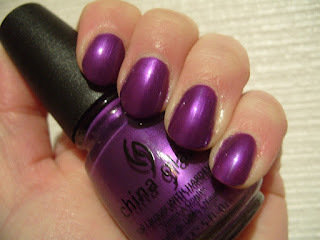 NOTD: China Glaze "Coconut Kiss"
NOTD: Wet n Wild Fantasy Makers "Once upon a time"
My best friend Jimmie returned from his travels to America with 3 polishes from a brand I've been lusting after for years - Fantasy Makers! :) I decided to put this one on first. 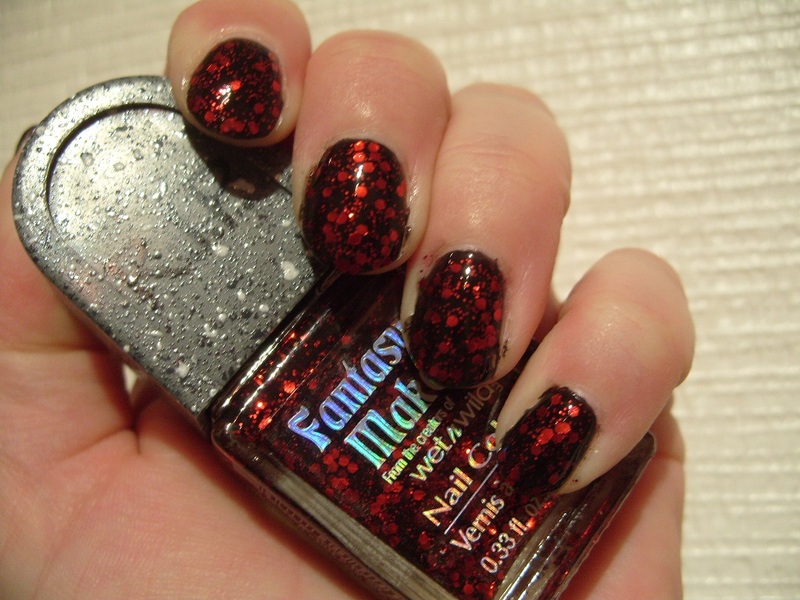 It's got red hexagonal glitter with little red glitter interspersed. I had to put it over a black creme polish to get the desired effect however, it's as usual with glitters pretty sheer. It is essentially a red version of Revlon "Facets of Fuschia" and I therefor anticipate a painful removal so I put it over PVA glue base :) Lets hope it peels as nicely as my trial! If not I need a new bottle of acetone to soak it off with... It was pretty messy to apply as I tried to place glitter bits... And after a coat of MegaShine top coat it's still a bit lumpy but it doesn't matter as the polish is awesome! I love the bottle for these and the colours are usually really cool - I've been wanting to try some of these for ages. I also got the glow-in-the-dark one called "Go with the glow" and a black one with tiny pink glitter called "Rest in pieces"! 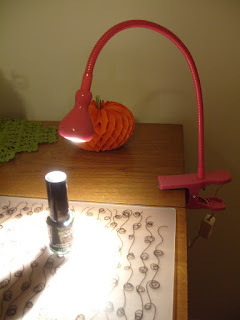 I can't wait to try the glow-in-the-dark one on my tootsies - how cool will it be to turn the light out at bedtime and see the toes glowing?? I saw this gold glitter polish from the James Bond collection and knew it had to be mine! 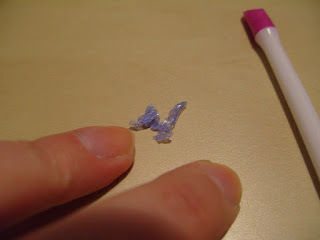 :) It's not just glitter, it's got little almost flakey bits as well. 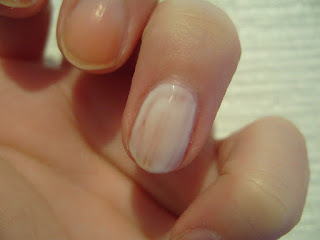 This is 3 coats but could have done with another coat! It's not sheer as such but it does leave less glitter particles in certain places if that makes any sense? 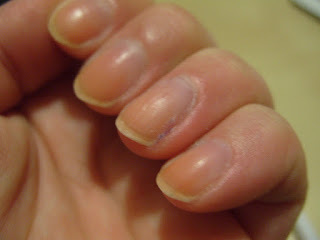 You can see some sheerness on my tips on my ring finger. It does however sparkle so intensely you will hardly notice any sheer bits! :) I finished with a coat of MegaShine to speed dry it so I could fiddle with my computer straight away (I have just installed Windows 8). So I have come down with a nasty case of laryngitis AGAIN (it's like last year is repeating itself all over again) so I am in my jim-jams and pottering about as my stupid computer has broken down and I can't play Skyrim a lot (I get tired of trying to play it on the laptop). 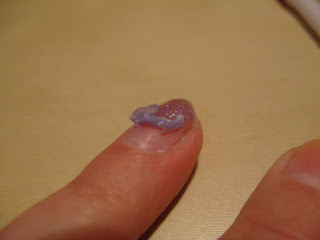 So I decided to try and recreate the PVA glue glitter base coat tutorial that Pretty Purple Polish has on her blog :) I won't try and explain or describe in depth, she's already done that, so I will just show you step by step photos of my adventures! I peeled it off with my thumb nail as my hoof stick wasn't really co-operating. I used Hobbycraft PVA glue in the red and white bottle. 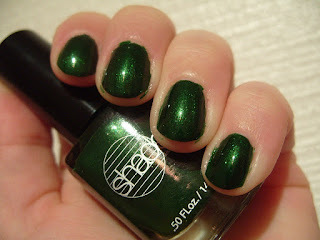 4 coats of OPI "Last Friday Night" (Katy Perry Collection) and a coat of MegaShine top coat. 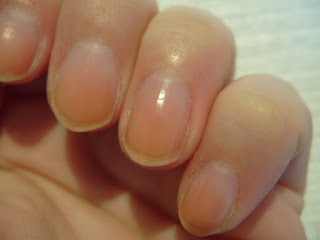 No nail damage, just a bit of glue residue and a slight bit of polish left, easily removed with acetone! As you know, I am constantly moaning about removing glitter polishes. Well, while perusing some of my fave blogs I came across a post on Nailasaurus that mentions using PVA glue as base coat and you will then just be able to peel the whole thing off!! Sounds too good to be true?? Will I be able to use all my awkward glitter polishes all the time now? 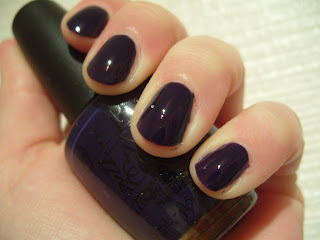 Check out the tutorial on Pretty Purple Polish and see for yourself :) I will be trying this tonight! 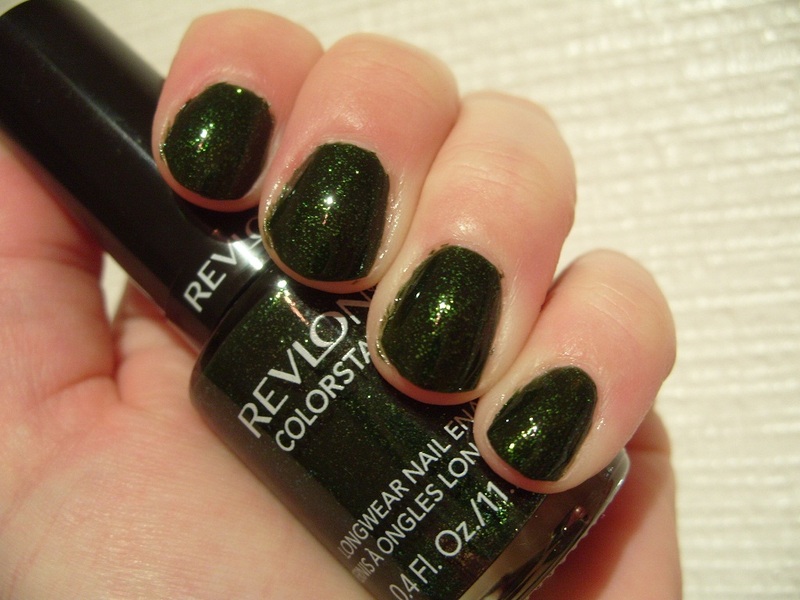 The new Revlon 'gel formula' is fairly thick and opaque and the brush in my bottle wasn't very good. It seemed to overload with the polish and pool on the nail. It covered well in 2 coats however but was tricky to apply neatly. It dries fairly quickly though and to a high shine. I already have tip wear however after just one day of office work... But I am the chipping queen so it's rare that polishes last more than couple days on me so that's not necessarily something that will happen for everyone! I will probably get another couple colours from this new collection once they hit Aberdeen! 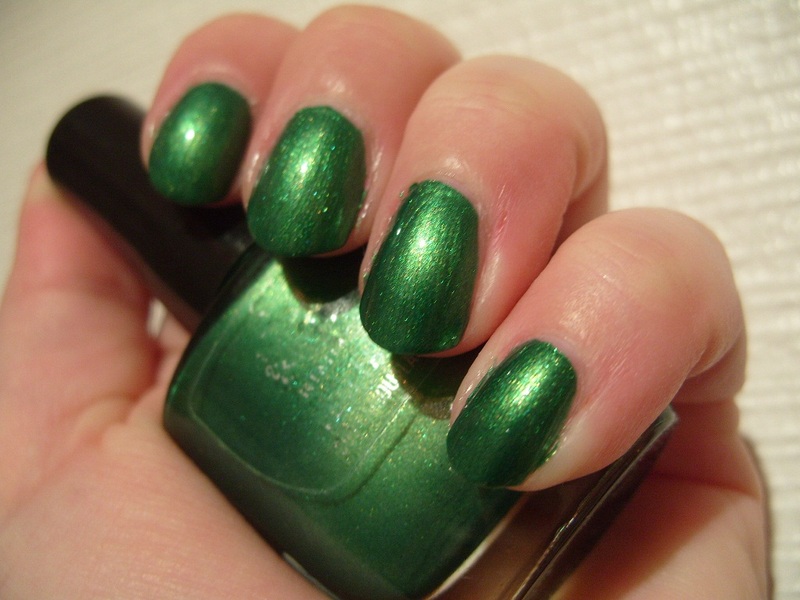 I think this looks like a bit of a moss-green version of China Glaze "Zombie Zest" maybe? Or a more golden China Glaze "Emerald Sparkle"?? What do you think, have you tried the new Revlons and if so which ones do you like?? 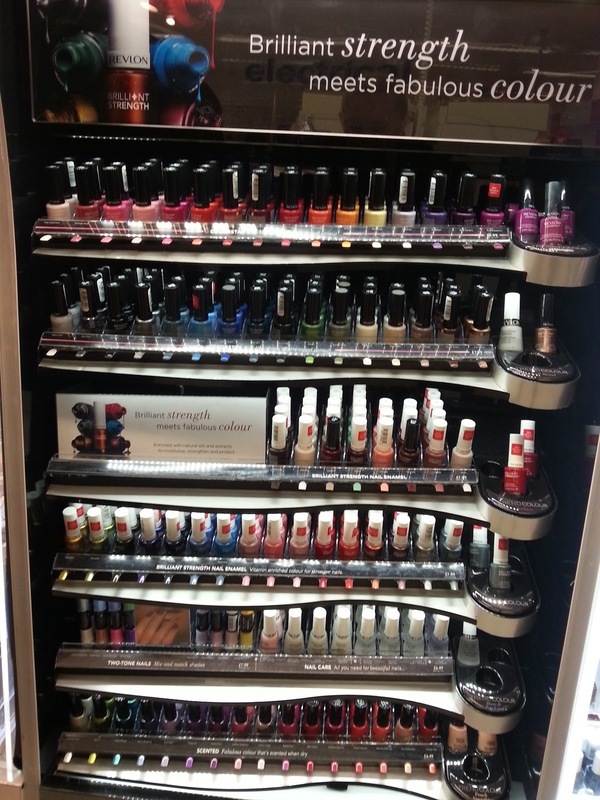 We went to Glasgow for a heavy metal gig on Sunday and we did some shopping and I found the new Revlon nail polish stand in Boots in Glasgow - I've still not seen these yet in Aberdeen! I bought "Rainforest" and eyed up a couple of others but I will wait until they come to Aberdeen to buy any more as I want to see how the new formula works.  I am hoping to put something new on tonight so we will see what takes me fancy!